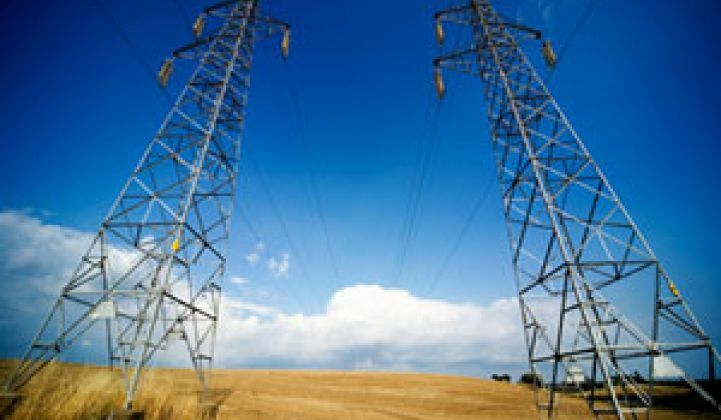 Accenture report finds that utilities are divided on whether grid disruptions are threats or opportunities. Smart grid IT consulting powerhouse Accenture just released a series of reports that have been making some news. 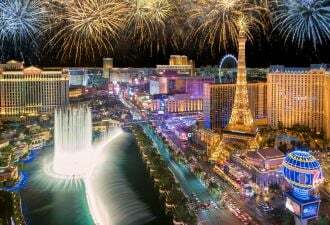 Most of the reports have been focused on the positive findings, including expectations of a return on smart grid investments that exceed initial forecasts. But amidst the optimism, there’s also a good deal of concern that utilities from North America to Europe and Asia are facing competition like they’ve never had to deal with before. Simply put, utilities are waking up to the existential challenge posed by the disruptions at the grid edge -- the place where energy and technology-empowered customers are threatening to render existing utility business models obsolete. “I was actually surprised to find that most utilities believe that competition will actually increase, and that the areas of competition are fairly broad,” Jack Azagury, global managing director of Accenture’s smart grid services business, said in an interview last week. It’s less surprising to see a large number of utility executives anticipating challenges in areas outside their traditional purview, such as behind-the-meter energy efficiency and management, distributed generation and plug-in electric-vehicle charging infrastructure. 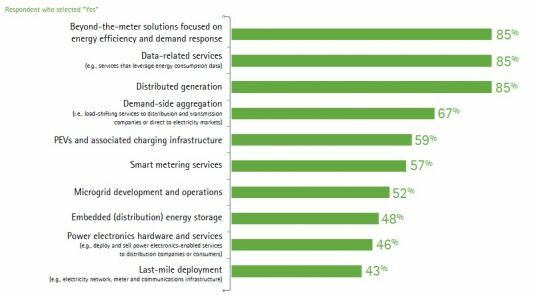 But as the chart makes clear, a significant number of executives are also seeing competition in smart metering, microgrids, energy storage, power electronics and “last-mile” infrastructure deployment -- all categories that have been a part of the traditional utility portfolio since the dawn of electrification. “We’re clearly starting to see a differentiation between utilities that are looking at turning all these new potential sources of competition into revenue and services and those that are concerned,” he said. Most likely the first effects of this change will be experienced by utilities serving European markets like Germany, where wind and solar power’s roles on the grid have already started to push energy giants like RWE to dramatically rethink its business model in order to manage the threat of distributed energy and consumer engagement. 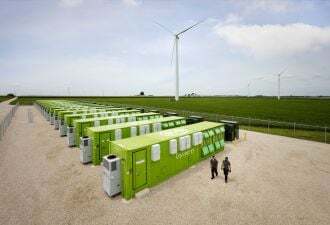 But in the United States, similar pressures are starting to come to utilities in California and on the East Coast, as well as those in deregulated markets like Texas and the Northeast, he said. 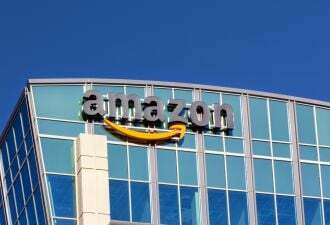 “My view is that a lot of this has to be driven through unregulated ventures,” he said, where retail energy providers have more room to compete against the host of “companies out there to vie for the energy consumer,” including telco and broadband providers, home security companies, third-party solar providers and high-end smart thermostat providers. But even for those utilities still operating in traditional regulated environments, “many utilities have very strong mandates to drive energy efficiency,” he noted. “We are seeing utilities [using] some innovative ways to get closer to their consumers, create a better relationship, and a much more sophisticated relationship, around energy efficiency." Finally, Azagury warned that last week’s survey results seemed to indicate that utility executives aren’t, in his opinion, taking seriously enough the potential disruptions that distributed energy technologies could bring to everyday grid operations. “This is a question we ask, because we expect the faults and operational disruptions on the grid to increase by 2020,” he said. 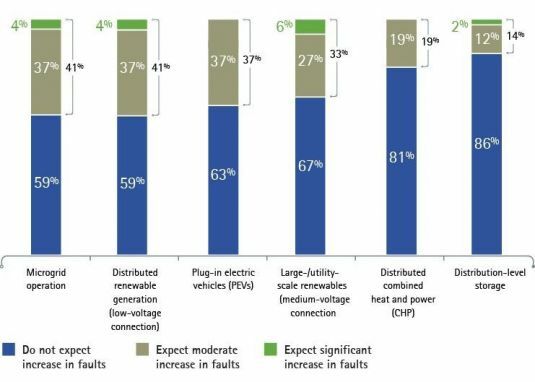 But as the following chart illustrates, relatively few respondents saw significant threats to distribution grid stability from a host of disruptive technologies -- although European utilities, which are facing these problems earlier than are their U.S. brethren, tended to have higher concern, he said, as the following chart illustrates. Network with leaders from GE, SDG&E, IBM, AT&T, Intel, PG&E, and more on topics like these that are driving innovation at the edge of the grid. Learn more about our new Grid Edge Executive Council.